Arriving at the American Museum of Natural History from its Central Park West entrance is a dramatic experience. The architecture is palace/fortress-like with huge, Ionic columns. It is obviously an important building, a destination for visitors from around the world. In front of the building stands a monument of Theodore Roosevelt on horseback, with an American Indian man standing on his right side and an indigenous African man standing on his left side. Text engraving on the side of the monument shows it was built in 1939. As I stood there observing the museum entrance on Thursday, I saw visitors pause in front of the monument and take photos of it, some frowned at it, others kept a poker face. 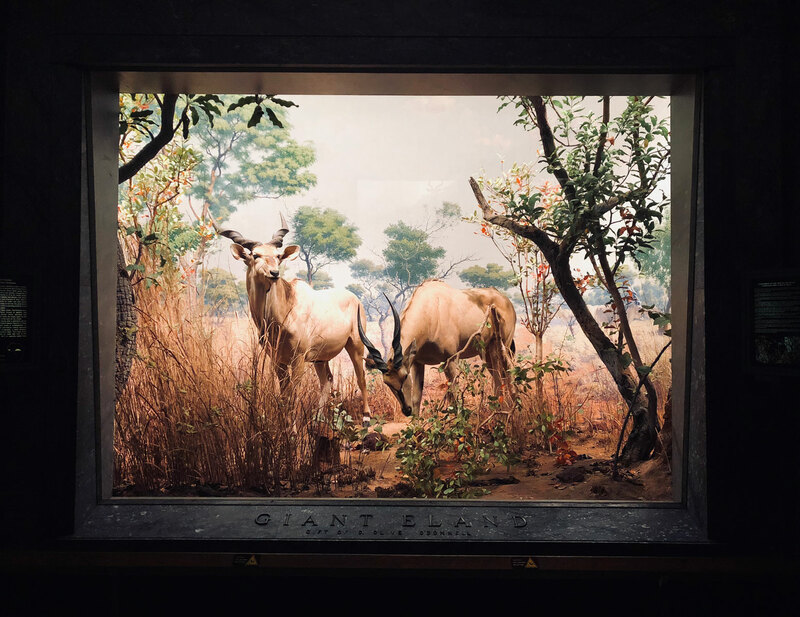 African Mammals—the one with a pack of elephants in the center, surrounded by well designed dioramas; The lighting is very effective in this hall. The space is dark overall, the dioramas softly lit, as if they are windows to other worlds. 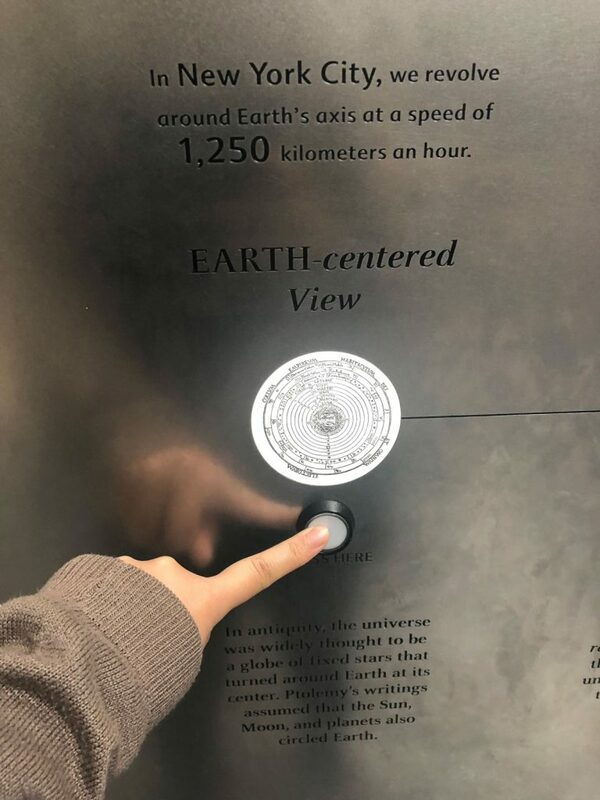 Hayden Planetarium—newer exhibits, consistent graphic and spatial design, lots of multimedia and interactive experiences and none of them was broken when I visited; The purpose of this button is to light up the diagram. Fun but not really necessary considering the abundance of natural light in the space. Asian Peoples—which I picked as my “older cultural/anthropology halls that needs some updates”. Why does the hall of “Asian Peoples” (and other older cultural halls) need to be updated? 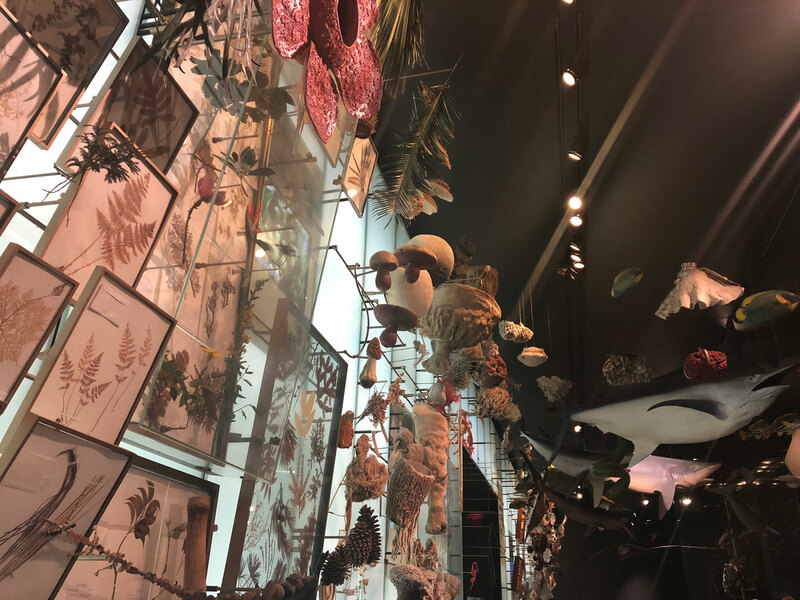 The exhibition inside suggests a Dualist view of the world from a Eurocentric perspective, objectifying Asian cultures by minimizing them to a collection of exotic objects presented in a way aimed to catch the eye. Time and space are both flattened in this hall as most artifacts are shown without accurate dates or locations. 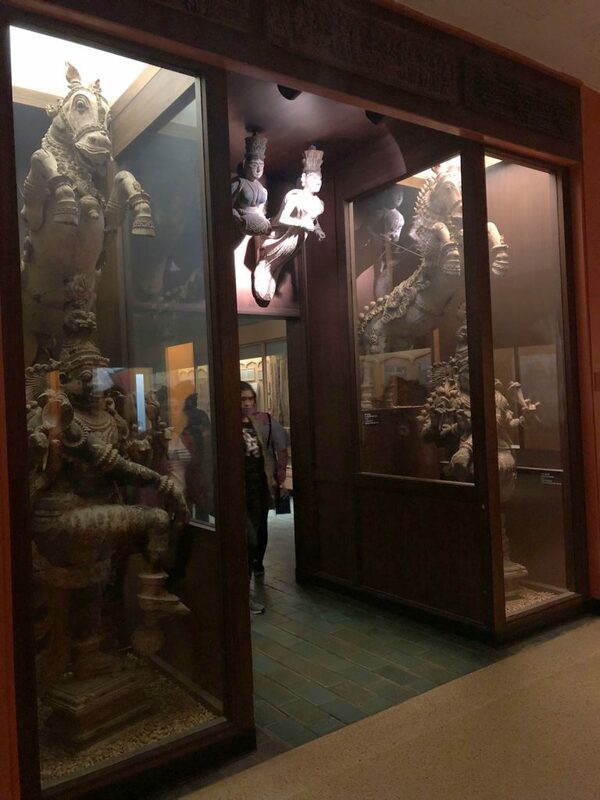 If one of the major goals for a museum is to educate, the Hall of Asian Peoples definitely fails at doing so. It reinforces cultural stereotypes and does not provide much information. I was surprised to find out the hall opened in 1980, given how unsophisticated the design is and the lack of respect for non-American cultures and religions. A group of what appears to be Indian statues mark the entrance to the space for Islamic cultures. 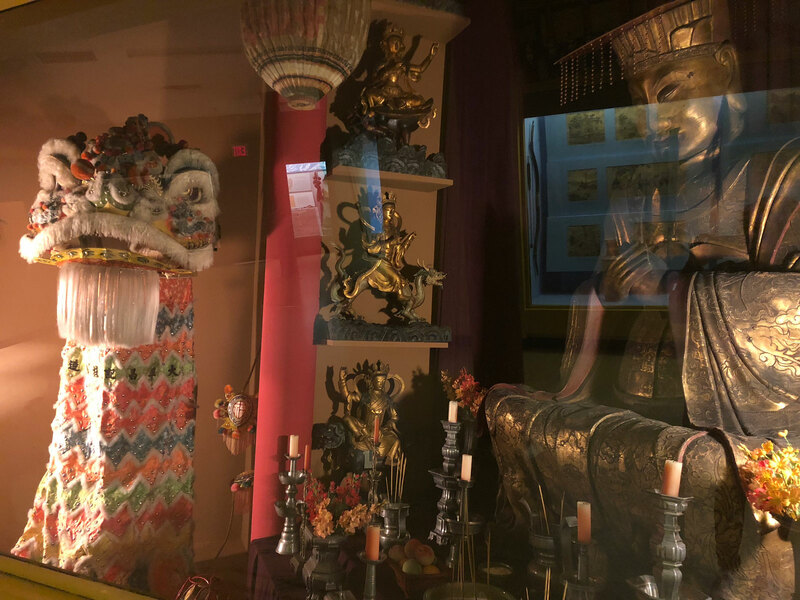 Statues of Chinese deities crammed into a small space, sharing room with a lion marionette used in celebrations, this is a far-from-accurate depiction of what a Chinese temple looks like. 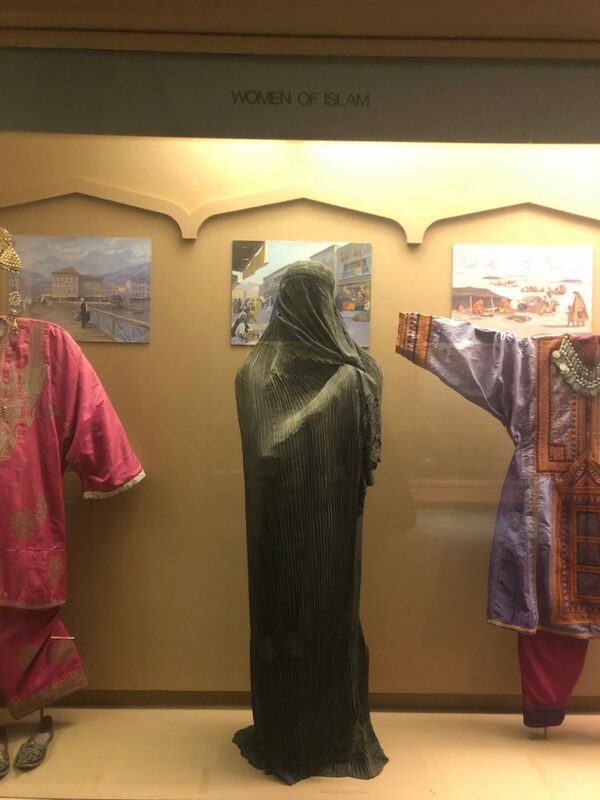 A display cabinet titled “Women of Islam”. How can we update it without changing the exhibits? to include voices from different parts of the world. Choose a few signature pieces that are representative of each culture and its history, and provide detailed explanations of how they were made, by whom, in what era, for what reason, do it in a way that is accurate, engaging and experience-oriented. Reorganize the artifacts spatially so it is clear what comes from which culture. Write better descriptions for the exhibits, set aside prejudices and provide more information that is factual and detailed. Archive the crude, inaccurate dioramas. These are particularly offensive. Categorize the exhibits chronologically to show progression of history. Improve lighting design in the space so the artifacts are evenly lit. Current lighting creates a dramatic effect (not in a good way) that reminds me of horror movies.